Apologies had been received from Judi Hibberd and Kathryn Stewart. John Nisbet had tendered his resignation because of other commitments. Rona would write to thank him for his participation. The minutes of the last meeting of July 9th 2013 were accepted. Terry had held an amicable meeting with John Nisbet when all the figures had been discussed. Copies of all documents had been passed to John. Money from the very successful Oddsocks performance had been divided between the Greenway Trust and the Village Hall. Each had received £779. Letters of thanks had been received. The Jubilee committee had chosen not to make a donation to the Residents’ Association. The issue of parking on footpaths was to be raised by Rona with John Whitehouse. The footpath survey had been completed and outlined to the Parish Council. All paths were now in good order. Only one footpath was in dispute and this was being handled by Cllr Vaughan Owen. The bid to WDC for funding to assist with the Parish plan had been successful. The Jubilee committee status had been discussed at the last meeting and it had been suggested it should be perceived as a sub group of BGRA. The Jubilee committee had accepted this. All paperwork had been circulated with agenda to remind committee members what had been discussed and agreed so far. The main concern remained funds available. Terry said BGRA had £1901.40 freely available. As it had been agreed to spend £1000 on the website, there was concern about spending the majority of the funds and it was felt a healthy reserve should be held. Terry explained that just under £11,000 had gone through the books this year. It was felt BGRA should explore other funding sources for the website as it was agreed there was no rush. Kenilworth Forum and WDC Small Grants were suggested as potential sources. The decision was taken to wait until further funding. It was agreed to discuss this further in February when it might be clearer what funding could be sought. Pat Hehir was now running Speedwatch. Terry said pressure was still being put on the police for more spots to site Speedwatch other than the current locations. This was likely to be affected by the speed limit changes which were at the consultation stage. John Whitehouse would be to reporting on this at the AGM. Thanks were given to Terry in getting it all running and it was noted that Burton Green had more Speedwatch volunteers than Kenilworth. This had been covered under Matters Arising. The lunch was planned for September 27th and, as agreed at earlier meetings, the cost would be £7 per person with restrictions as agreed on wine available. 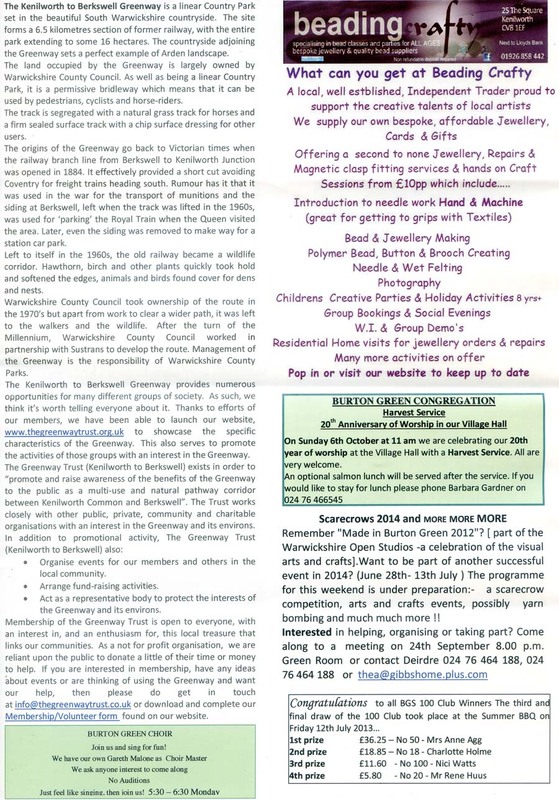 The Jubilee committee had held one meeting and were considering a Jazz Evening to be held at the Stanworths’ on June 14th 2014. Further details would be brought to the next meeting. The constitution required all officers and three committee members to stand down at the AGM, even if they were prepared to stand for re-election. All officers were happy to stand for re-election unless others wished to take up their positions. Both John Nisbet and Marlene Hills would stand down and not seek re-election. Faith Ward also agreed to stand down but to seek re-election. The Chair’s Report had been included in the Bugle to avoid a long report at the meeting. All reports would be limited to three minutes in duration. Rona wished to encourage greater participation in the proceedings. Rona and Mary agreed to arrange the refreshments (wine and cheese) and it was decided donations should be requested. 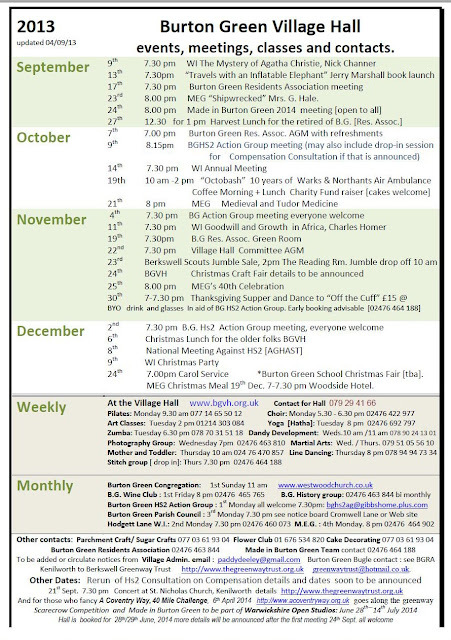 The Parish Plan group meeting would be meeting later in the week to decide on an action plan. 374 surveys had been returned from 387 households which was an excellent return (the highest in Warwickshire). Burton Green was revealed as a mature and stable community with 42% of respondents resident here for over 21 years and 150 people in the age bracket 61-80. Why had people moved here? 258 cited the rural nature and 278 chose to call it a pleasant location. Significantly, 164 would leave only because of HS2. Use of the Village Hall was frequent or very frequent by 125 residents and 237 see the Hall as important or very important to the village. 218 people use the Greenway frequently or very frequently and 304 respondents view it as important. 75 % of residents know how to contact BGRA. There were diverse comments about the Association but no one particular issue. Rona would make reference to this in her AGM remarks. High speed broadband needed actioning. It was important to find out where funding is available and what the timetable would be. Once a Parish Plan Action Plan had been drawn up there would be a community meeting with funding from WDC. Faith Ward and Eileen Nisbet were working with Burton Green School to ensure young people’s views were included. Rona and Mary were similarly working with Heart of England School. Committee members felt Kenilworth students should be included. An email from WDC planning department had explained that Le Van had withdrawn its appeal as WDC lawyers had established that the number of vans could legally be increased and so a certificate of lawfulness had been granted. Le van has now sold to a property investor who has been involved along the way. The investor had attended a meeting of the parish council and wished to work with the community. The plan was to have 20 extra mobile homes for over 55s. These would not be classed as dwelling houses so could not contribute to the new housing requirements. Issues of drainage and traffic wouldn't need planning permission. They would be environmental health matters. The Produce Show had been very successful with more entries and new people involved from the village and the school. However, it was felt those attending to view rather than exhibit was lower than in previous years. Appreciation for the organisation of the Produce Show was expressed by the committee. The compensation consultation was open till Dec 4th. Andy explained the situation was as before with the property bond added. This was only for properties that would be in VPZ 120 zone. It would allow for property to be sold and if HS2 happened that can be then sold to the Government. Andy felt this was unlikely to be effective. Properties over tunnels were to be ignored as it was claimed they would not be affected. BGRA needed to do a response. Action: Rona. HS2 action group would hold a consultation response form session on Wednesday 9th October. Andy went on to explain that a presence would still be made at party conferences. The KPMG Report about costing £15billion a year was generally being disregarded as it did not make sense. Causality had been ignored and the link between connectivity and GDP was made. The government was now trying to distance HS2 from the economic argument and moving to capacity issues. A consultation road show was to be held in Kenilworth on November 1st. Andy, Kathryn, Rona and Thea were to meet with Jeremy Wright MP and then with HS2 to present current views from Burton Green. Cllr Taylor said the work on the Neighbourhood Plan was continuing. A Birmingham airport presenter had attended the Parish Council meeting where she mentioned the airport vision linking with HS2 concept. No changes to current flight paths were envisaged in the near future. Terry presented the attached accounts which were to be independently inspected prior to the AGM. Thanks were expressed to Terry for such an efficient job. The most recent edition was being distributed by the team. Additional assistance was requested to cover areas of those on holiday. Mary would be grateful for leads for additional advertising. The next edition was scheduled for the second week in December. Many thanks were again given to Mary. The Thursday bus capacity problem had temporarily been solved by the provision of an additional minibus. It was hoped a more permanent solution would be reached. The next police clinic was to be held on Thursday 24th September at 7p.m. A dog waste bin was being installed near Cromwell Lane bridge later in the week and it was hoped this would alleviate the dog waste problem. Mary said the Royal British Legion was planning to plant Flanders poppies to commemorate the First World War and she wondered if some could be sown on “the Jubilee verge.” Matters of funding and mowing regimes would need to be investigated. Berkswell Trust was to be approached again regarding the siting of a Christmas tree on land adjoining the almshouses. Another alternative site would be “the Jubilee verge.” A better form of lighting also needed to be sourced and safety matters considered. Thanks were expressed to Janet for her efficient work as Minutes Secretary. Ann Blacklock reported that Martyn Stacey was moving to Warwick, to be replaced by Jo Ball. The committee recorded their thanks to Martyn. Ann Also said the number of mobile library vans was being cut from five to three but it was hoped not to impact on current services. Stephen Hey was working on the Local Plan including Green Belt changes. Specific proposals would be available for consultation in November. Thanks were given to Ann for her attendance. 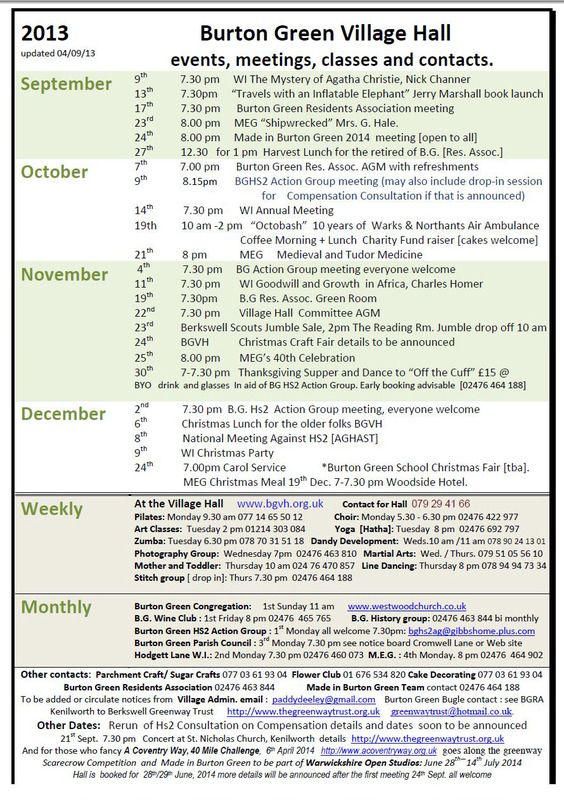 The next committee meeting would take place on Tuesday November 19th at 7.30p.m.at the Village Hall. The AGM was scheduled for October 7th at 7p.m. 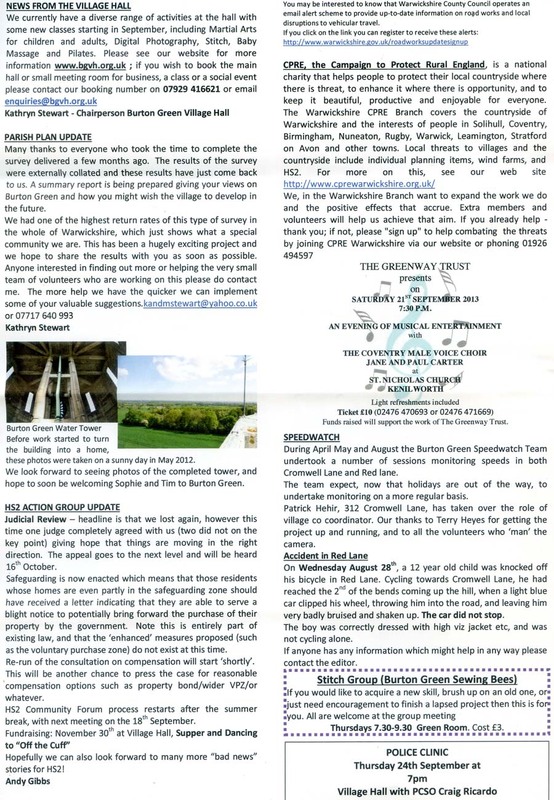 The September 2013 edition of the Bugle has been published. The archive of back issues of the Bugle is here: Bugle Archive. A detailed personal account of the campaign has just been published, as part of a wider account of things I’ve been involved in. I’m holding a local book launch, with wine and cheese and any profits to the HS2 campaign. 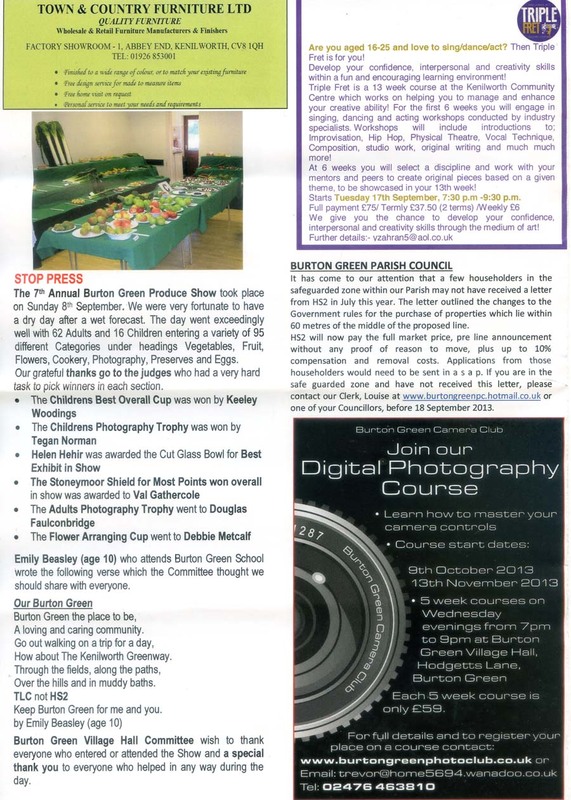 This will be in the Burton Green Village Hall, Hodgetts Lane, 7.30-8.30pm on Friday 13th September. Books will be discounted to £10 each (cover price is £12.99). 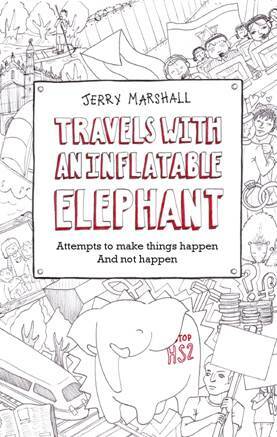 If you can’t make it and you would like a print copy (which, unlike the Kindle version, has 12 pages of photos), drop me an email (jerry.c.a.marshall@gmail.com) with your postal address. £12 per copy including p & p. All profit to the campaign, but mention HS2 in the email to be on the safe side, because I’m also selling via my work network with profits to the charity I run. You should have it by the end of next week. It’s been a privilege to work with you all in the earlier stages of the campaign. Thank you. We’re on a roll – keep up the good work!